Osmosis: Opioid agonists. (2019, April 24). Retrieved from (https://www.osmosis.org/learn/Opioid_agonists). Morphine, sold under many trade names, is a pain medication of the opiate type. It acts directly on the central nervous system (CNS) to decrease the feeling of pain. It can be used for both acute pain and chronic pain. Morphine is also frequently used for pain from myocardial infarction and during labour. It can be given by mouth, by injection into a muscle, by injecting under the skin, intravenously, into the space around the spinal cord, or rectally. Fentanyl is a potent, synthetic opioid analgesic with a rapid onset and short duration of action. It is a strong agonist at the μ-opioid receptors. Historically, it has been used to treat breakthrough pain and is commonly used in pre-procedures as a pain reliever as well as an anesthetic in combination with abenzodiazepine. Opioids are substances that act on the nervous system in a similar way to opiates such as morphine and codeine. In a medical context the term usually indicates medications that are artificially made rather than extracted from opium. Common examples include oxycodone, hydrocodone, and hydromorphone. Opioids are primarily used in medicine for the treatment of pain. Codeine, also known as 3-methylmorphine, is an opiate used to treat pain, as a cough medicine, and for diarrhea. It is typically used for mild to moderate degrees of pain. Greater benefit may occur when combined with paracetamol (acetaminophen) or aspirin. Evidence for use for cough is poor. Pethidine or meperidine (trade name Demerol) is a synthetic opioid analgesic of the phenylpiperidine class. Pethidine is indicated for the treatment of moderate to severe pain, and is delivered as a hydrochloride salt in tablets, as a syrup, or byintramuscular, subcutaneous, or intravenous injection. Methadone (trade name Dolophine) is an opioid used to treat pain and as maintenance therapy or to help with detoxification in people with opioid dependence. Detoxification can either occur relatively rapidly in less than a month or gradually over as long as six months. While a single dose has a rapid effect, maximum effect can take five days of use. The effects last about six hours after a single dose and a day and a half after long-term use. Methadone is taken by mouth or by injection into a muscle or vein. Loperamide (trade name Imodium) is a medication used to decrease the frequency of diarrhea. It is often used for this purpose in gastroenteritis, inflammatory bowel disease, and short bowel syndrome. It is not recommended for those with blood in the stool. The medication is taken by mouth. Although it is an μ-opioid receptor agonist, it does not cross the blood-brain barrier. Dextromethorphan is an antitussive (cough suppressant) drug of the morphinan class with sedative and dissociative properties. It is one of the active ingredients in many over-the-counter cold and cough medicines such as Mucinex DM, Robitussin, NyQuil, Dimetapp, Vicks, Coricidin, Delsym, TheraFlu, and others. Dextromethorphan has also found numerous other uses in medicine, ranging from pain relief (as either the primary analgesic, or an opioid potentiator) over psychological applications to the treatment of addiction. It is sold in syrup, tablet, spray, and lozenge forms. In its pure form, dextromethorphan occurs as a white powder. Tramadol (trade name Ultram) is an opioid pain medication used to treat moderate to moderately severe pain. When taken as an immediate-release oral formulation, the onset of pain relief usually occurs within about an hour. It has two different mechanisms. First, it binds to the μ-opioid receptor. Second, it inhibits the reuptake of serotonin and norepinephrine. Diphenoxylate (brand name Diocalm) is a centrally-active opioid drug of the phenylpiperidine series that is used for the treatment of diarrhea. It acts by slowing intestinal contractions and peristalsis allowing the body to consolidate intestinal contents and prolong transit time, thus allowing the intestines to draw moisture out of them at a normal or higher rate and therefore stop the formation of loose and liquid stools. It is the main active ingredient in the anti-peristaltic medication Lomotil, which also contains atropine. Butorphanol is a morphinan-type synthetic opioid analgesic. 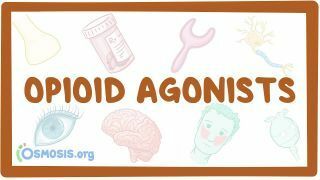 Full opioid agonists are contraindicated with partial agonists or antagonists due to the risk of precipitation of . A 65-year-old man is undergoing a right knee replacement, and anesthesia is induced with large dose of fentanyl and propofol. He begins to have respiratory decompensation, and bag and mask ventilation is attempted but is unsuccessful. Despite repositioning his head and jaw as well as forcefully attempting to ventilate the patient, there is no rise of his chest wall and his pulse oximetry continues to fall. Attempts to open his mouth to insert a LMA become exceedingly difficult because his jaw muscles are tightly clenched. What is the most likely etiology of this anesthetic complication?